One year ago today, I shared with you the story of my friend Drew Olanoff's battle with Hodgkins Lymphoma, and his choice to take cancer head-on with a site and cause, Blame Drew's Cancer. The idea moved from novelty to phenomenon, as tens of thousands of people took to Twitter and other Web outlets to blame Drew's cancer for everything. With Drew's cancer in remission and his chemo treatments in the past, it's not time to forget about blaming cancer, but it is time to stop blaming Drew. Starting today, a new Web site at http://blamecancer.com/ has launched, to continue the fight against cancer, which took nearly 600,000 lives, in the US alone, in 2009. The site and new cause, Blame Cancer, extends a year-long fight that has seen high-profile involvement from charities including Lance Armstrong's LiveStrong, and support from The Price Is Right's Drew Carey, who famously bid six to seven figures of support, in exchange for Drew Olanoff's @drew Twitter account. Like the previous campaigns, Blame Cancer will be run in partnership with new foundations and charities who are more than willing to lend their brand, their time and their money to support the fight against the disease. The first to step up is VeggieGrill, who approached Drew, saying they wanted to do something to support the cause. Details will arrive in coming weeks, but the process of "donation by action" that Drew promoted in round one is going to be proven again in round two. "Blame Drew's Cancer became part of the vernacular so it's not a novelty," Drew Olanoff said this morning. "I want that to stop, but I want people to just blame cancer. Whenever something sucky happens, I want people to blame cancer, in real life, on Twitter, on the Internet, on Facebook, and that's it." Drew says that BlameCancer.com is going to be an anchor site for this movement of donation by action, and promises that this will "live forever" - powered only by the words of the masses who want to give Cancer a kick in the shins. "With BlameDrew'sCancer, we raised a bunch of money and a bunch of awareness, which was key," Drew said. "It was unique. It was not cookie cutter. You had to think of something, and people did - well over 25,000 people." 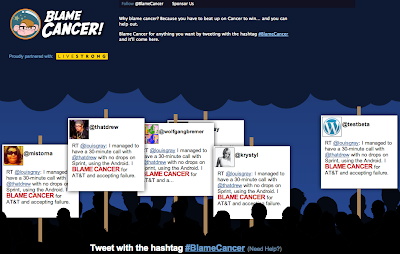 To Blame Cancer for whatever is driving you nuts today, simply add the hashtag #blamecancer to any tweets you put on Twitter or "Blame Cancer" wherever you are - on the Web or off. All tweets that have the #blamecancer hashtag are counted and displayed on BlameCancer.com. I #BlameCancer for my father, aunt, and countless others in my family and friends' families for having to battle the disease. It's time to make cancer history starting with being a part of Web history.